Artistic representation of a red dwarf star. 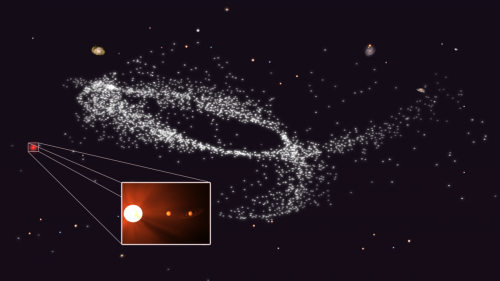 An international team of scientists, led by astronomers at Queen Mary University of London, report of two new planets orbiting Kapteyn's star, one of the oldest stars found near the Sun. One of the newly-discovered planets could be ripe for life as it orbits at the right distance to the star to allow liquid water on its surface. Discovered at the end of the 19th century and named after the Dutch astronomer who discovered it (Jacobus Kapteyn), Kapteyn's star is the second fastest moving star in the sky and belongs to the galactic halo, an extended cloud of stars orbiting our galaxy. With a third of the mass of the sun, this red-dwarf can be seen in the southern constellation of Pictor with an amateur telescope. The astronomers used new data from HARPS spectrometer at the ESO's La Silla observatory in Chile to measure tiny periodic changes in the motion of the star. Using the Doppler Effect, which shifts the star's light spectrum depending on its velocity, the scientists can work out some properties of these planets, such as their masses and periods of orbit. The study also combined data from two more high-precision spectrometers to secure the detection: HIRES at Keck Observatory and PFS at Magellan/Las Campanas Observatory. "We were surprised to find planets orbiting Kapteyn's star. Previous data showed some moderate excess of variability, so we were looking for very short period planets when the new signals showed up loud and clear," explains lead author Dr Guillem Anglada-Escude, from QMUL's School of Physics and Astronomy. 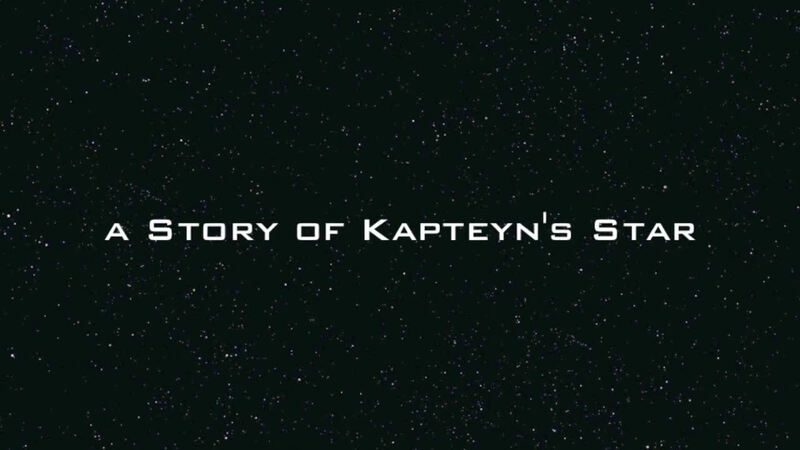 Based on the data collected, the planet Kapetyn b is at least five times as massive as the Earth and it orbits the star every 48 days. This means the planet is warm enough for liquid water to be present on its surface. The second planet, Kapteyn c is a more massive super-Earth and quite different: its year lasts for 121 days and astronomers think it's too cold to support liquid water. At the moment, only a few properties of the planets are known: approximate masses, orbital periods, and distances to the star. By measuring the atmosphere of these planets with next-generation instruments, scientists will try to find out whether they can bear water. Typical planetary systems detected by NASA's Kepler mission are hundreds of light-years away. In contrast, Kapteyn's star is the 25th nearest star to the sun and it is only 13 light years away from Earth. What makes this discovery different however, is the peculiar story of the star. Kapteyn's star was born in a dwarf galaxy absorbed and disrupted by the early Milky Way. Such galactic disruption event put the star in its fast halo orbit. The likely remnant core of the original dwarf galaxy is omega Centauri, an enigmatic globular cluster 16, 000 light years from earth which contains hundreds of thousands of similarly old suns. This sets the most likely age of the planets at 11.5 billion years; which is 2.5 times older than Earth and 'only' 2 billion years younger than the universe itself (around 13.7 billion years). Dr Anglada-Escude adds: "It does make you wonder what kind of life could have evolved on those planets over such a long time." Professor Richard Nelson, Head of the Astronomy Unit at QMUL, who didn't participate in the research, commented: "This discovery is very exciting. It suggests that many potentially habitable worlds will be found in the next years around nearby stars by ground-based and space-based observatories, such as PLATO. Until we have detected a larger number of them, the properties and possible habitability of the near-most planetary systems will remain mysterious." More information: 'Two planets around Kapteyn's star: a cold and a temperate super-Earth orbiting the nearest halo red-dwarf' will be published in the journal Monthly Notices of the Royal Astronomical Society (MNRAS) in early July and a pre-print is available online from today (Wednesday 4 June). Prime target for JWST I would guess. I am curious as to how the fast pace of the planet's (48 days!) orbit affects the weather there. I so look forward to the ability to measure atmosphere, etc. on these planets. JWST is limited to directly imaging large planets quite far from their stars, I don't think this would fall into that category. It can measure smaller ones but only transiting planets. If this is the case. I wish we would of invest on 3 new Keplers instead. Nice planetary find, but read some crappy article putting down the possibility of life on planets such as these just to get their own jollies taking away the hopes of others. Just in time for the killers of hope to poo poo it. Maybe one day we will learn as a species to put pathoskeptiks in prison or in exile around some island never to see the light of society again. Just like the reports by con artists denying water on Mars, spreading pessimism, despair, and damaging the public order. We need to keep in front of us that there is a place in the universe for us out there. The only way we will achieve that is to put away from us all fear mongers, pathoskeptics, and other troublemakers. No need to be hard on JWST, it will be very sensitive in transit spectroscopy when the time comes. Kepler was nice but it was designed to give us the statistics of planets, it's ill-suited to finding planets which are prime targets for follow-up. But there are better things on the way. If you wanted to do that the best way is much wider field transits like two up coming mission TESS and Plato. TESS in particular will survey the whole sky for short period transiting planets to find the closest systems we can do transit spectroscopy with. Special attention is paid to JWST's continuous viewing zones so that it's more suited to finding earth like planets where JWST can do follow up. Plato is not as wide field but it goes deeper and will tell us a lot about planets in different regions of the galaxy. Secondly in the quite near future we will have a new generation of titanic ground based telescopes from 25 to 40 meters. The European Extremely Large Telescope will be capable of directly imaging super-earths like Gliese 581d with it's first generation exoplanet imager. With imaging comes characterisation of it's atmosphere and even details of it's surface. With future instruments this will improve too. Kepler told us a lot about planets but it's not what is needed now. It's worth saying that although JWST cannot image small planets there are indirect methods of mapping exoplanets using the transits. This has already been done even though these objects are completely unresolved. There is a bright future for exoplanets and JWST is part of that. Nice planetary find, but read some crappy article putting down the possibility of life on planets such as these just to get their own jollies taking away the hopes of others. Just in time for the killers of hope to poo poo it. Realism isn't a bad thing. Knowing that life around red dwarfs isn't very likely helps us prioritize our search targets. The odds of life around a red dwarf are pretty low, because of solar flares and because it'll only have habitable temperatures on the terminator (a thin band around the planet). But their greater age may be enough to make up for their lack of habitable area and high odds of extinction-causing events, and allow durable life to arise and endure anyway.